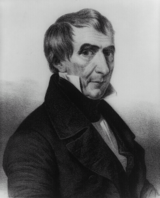 William Henry Harrison ( February 9, 1773 – April 4, 1841) was an American military leader, politician, and the ninth President of the United States. He served as the first Governor of the Indiana Territory and later as a U.S. Representative and Senator from Ohio. Harrison first gained national fame as a war hero, defeating American Indians at the Battle of Tippecanoe in 1811 and earning the nickname "Tippecanoe" (or "Old Tippecanoe"). As a general in the subsequent War of 1812, his most notable contribution was a victory at the Battle of the Thames, which brought the war in his region to a successful conclusion. When Harrison took office in 1841 at the age of 68, he was the oldest man to be elected President; a record that stood for 140 years, until Ronald Reagan was elected in 1980 at the age of 69. Harrison died thirty days into his term — the briefest presidency in the history of the office. He was also the first U.S. president to die while in office. His death threw the country into a potential constituional crisis. Harrison was born into a prominent political family at the Berkeley Plantation in Charles City County Virginia, the youngest of the seven children of Benjamin Harrison V and Elizabeth Basset. His father was a Virginia planter who served as a delegate to the Continental Congress (1774–1777), signed the Declaration of Independence (1776), and was Governor of Virginia (1781-1784). William Henry Harrison's brother, Carter Bassett Harrison, later became a member of the United States House of Representatives, representing Virginia. Harrison's father-in-law was Congressman John Cleves Symmes. His stepmother-in-law was the daughter of New Jersey Governor William Livingston. Before attending the University of Pennsylvania, Harrison attended Hampden-Sydney College. He entered school at the age of 14. Harrison attended the University of Pennsylvania with the intention of becoming a physician, but did not receive a degree. 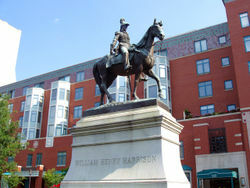 His father's death, in 1791, left Harrison without money for further schooling and so, at the age of 18, he was commissioned as an ensign in the U.S. Army. He was sent to the Northwest Territory, where he spent much of his life. Harrison served as aide-de-camp to General "Mad Anthony" Wayne, from whom he learned how to successfully command an army on the American frontier. Harrison participated in Wayne's decisive victory at the Battle of Fallen Timbers in 1794, which brought the Northwest Indian War to a close. Lieutenant Harrison was one of the signers of the Treaty of Greenville in 1795, which opened much of present-day Ohio to settlement by white Americans. Harrison resigned from the Army in 1798 to become Secretary of the Northwest Territory, and acted as governor when Governor Arthur St. Clair was absent. In 1799, Harrison was elected as the first delegate representing the Northwest Territory in the Sixth United States Congress, serving from March 4, 1799, to May 14, 1800. As delegate, he successfully promoted the passage of the Harrison Land Act, which made it easier for people to purchase land for settlement in the Northwest Territory. 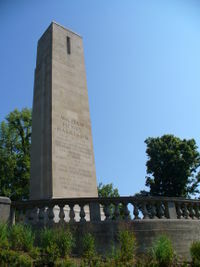 Harrison resigned from Congress to become governor of the newly formed Indiana Territory at Vincennes, a post he held for twelve years, until 1813. A primary responsibility as territorial governor was to obtain title to Native American lands so that white settlement could expand in the area and the region could attain statehood. Harrison oversaw numerous treaties, purchasing much of present-day Indiana from Native American leaders. Tensions, always high on the frontier, became much greater after the 1809 Treaty of Fort Wayne, in which Harrison secured the purchase of more than 2,500,000 acres (10,000 km²) of American Indian land. An Indian resistance movement against U.S. expansion had been growing around the Shawnee brothers Tecumseh and Tenskwatawa ("The Prophet"). Tecumseh called upon Harrison to nullify the Treaty of Fort Wayne, warned against any whites moving onto the land, and continued to widen his Indian confederation (see " Tecumseh's War"). In 1811, Harrison was authorized to march against the confederacy, winning his famous victory at Prophetstown next to the Wabash and Tippecanoe Rivers. During the War of 1812, Harrison took command of the Army of the Northwest. He won victories in Indiana and Ohio before invading Canada and crushing the British at the Battle of the Thames, in which Tecumseh was killed. Harrison subsequently resigned from the army because of ongoing disagreements with Secretary of War John Armstrong. After the war, Harrison was elected to various political offices, including the U.S. House of Representatives from Ohio, serving from October 8, 1816, to March 4, 1819. He was defeated as a candidate for governor of Ohio in 1820 but served in the Ohio State Senate from 1819 to 1821. In 1824, he was elected to the U.S. Senate, where he served until May 20, 1828, when he resigned to become Minister to Colombia from 1828 to 1829. Harrison was a tall man, and in Congress he was referred to by fellow westerners as a Buckeye, as were other tall pioneers on the Ohio frontier, as a term of endearment in respect of the Buckeye chestnut tree. Harrison was the Northern Whig candidate for President in 1836, but lost the election to Martin Van Buren. He was the candidate again in the 1840 election, winning a landslide victory largely because of his heroic military record and a weak U.S. economy. The Democrats attempted to ridicule Harrison by calling him "Granny Harrison, the petticoat general," because he resigned from the army before the War of 1812 ended. When asking voters whether Harrison should be elected, they asked them what his name backwards was, which happens to be "No Sirrah." Harrison's vice presidential running-mate was John Tyler, and their campaign was marked by exaggeration of both Harrison's military exploits and of his connections to the common man. (Harrison came from an aristocratic Virginia family, but his supporters promoted him as a humble frontiersman in the style of the popular Andrew Jackson. A memorable example of these efforts was the Gold Spoon Oration delivered by a Whig congressman.) Harrison and Tyler's campaign slogans of " Log Cabins and Hard Cider" and "Tippecanoe and Tyler, too" are among the most famous in American politics. When Harrison arrived in Washington, he focused on showing that he was still the stalwart hero of Tippecanoe. He took the oath of office on March 4, 1841, an extremely cold and windy day. Nevertheless, he faced the weather without his overcoat and delivered the longest inaugural address in American history. At 8,445 words, it took nearly two hours to read (even after his friend and fellow Whig, Daniel Webster, had edited it for length). He later caught a cold, which then developed into pneumonia and pleurisy. (According to the prevailing medical misconception of the times, it was believed that his illness was caused by the bad weather, when, in fact, he was likely a victim of the virus that causes the common cold.) He sought to rest in the White House, but could not find a quiet room, as he was deluged with people seeking his favour in the hope that he would appoint them to the numerous offices the president then had at his disposal. His doctors tried everything to cure him, applying opium, castor oil, Virginia snakeweed, and even actual snakes. But the treatments only made Harrison worse and he went into delirium. He died a month later, at 12:30 a.m., on April 4, 1841, of right lower lobe pneumonia, jaundice, and overwhelming septicemia, becoming the first American president to die in office. His last words were "Sir, I wish you to understand the true principles of the government. I wish them carried out. I ask nothing more." Harrison served the shortest term of any American president: only 30 days, 11 hours and 30 minutes. The untimely death of Harrison was a disappointment to Whigs, who hoped to pass a revenue tariff and enact measures to support Henry Clay's American System. John Tyler, Harrison's successor and a long-time Democrat, abandoned the Whig agenda, leaving himself without a party. Harrison's son, John Scott Harrison, was also elected to the U.S. House of Representatives from Ohio from 1853 to 1857. Harrison's grandson, Benjamin Harrison of Ohio, became the 23rd president in 1889, making them the only grandparent-grandchild pair of presidents to date. In 1889, President Benjamin Harrison gave his inaugural address in the rain. Understanding his grandfather's mistakes, he asked his outgoing predecessor (and later his successor), Grover Cleveland, to hold an umbrella above his head, since he delivered the longest inaugural address since his grandfather's. According to legend, Tecumseh had placed a " curse" on Harrison, claiming that every President to be elected in a year ending with the number zero (which happens every 20 years) would die in office. Harrison, Lincoln (elected 1860), Garfield (elected 1880), McKinley (elected 1900), Harding (elected 1920), Roosevelt (elected 1940), and Kennedy (elected 1960) all died in office, falling prey to the Curse of Tecumseh, sometimes called the "zero-year curse". Ronald Reagan, elected in 1980, broke the curse. Tecumseh and Tenskwatawa, their interactions with William Henry Harrison and the Prophetstown battle at Tippecanoe are partly fictionalized in the Alvin Maker series of books by Orson Scott Card. An episode of The Simpsons includes a song entitled "Presidents' Song", which was a tribute to lesser-known presidents. It included the lyric: "There's Taylor, there's Tyler, there's Fillmore and there's Hayes. There's William Henry Harrison, 'I died in thirty days!'" In the movie Turk 182, the slogan repeated throughout is "Zimmerman flew ! Tyler knew !" a jab at the mayor by the hero referencing Harrison's campaign slogan. Harrison is the first, but not only, US president to have no military vessel named after him. Harrison was a founding member of Christ Church, Cincinnati.